Taking care of your fall garden makes your garden healthy and gorgeous next year, too. Here's a fall garden checklist that will help you know what to do now. Knock some items off the fall garden checklist! By the end of the summer, some plants have passed their prime and the garden may start looking like it’s ready for a winter’s rest. But it doesn’t mean that it has to stop looking beautiful. We’ve compiled a fall garden checklist of things to do during the fall to make sure your garden shines in every season. Some of the tasks will add instant impact, and others will help your garden look wonderful again next year. It takes some work to make a garden gorgeous year round, but we’ve divided the list into early, mid- and late fall to divide up the work. It’s much easier to do a little bit of work here and there. Now go ahead and scroll on to learn what tasks you need to do now! Pull out the camera and snap some shots of what you’ve accomplished this year. Don’t forget to take a few photos of areas that need improvement, too! 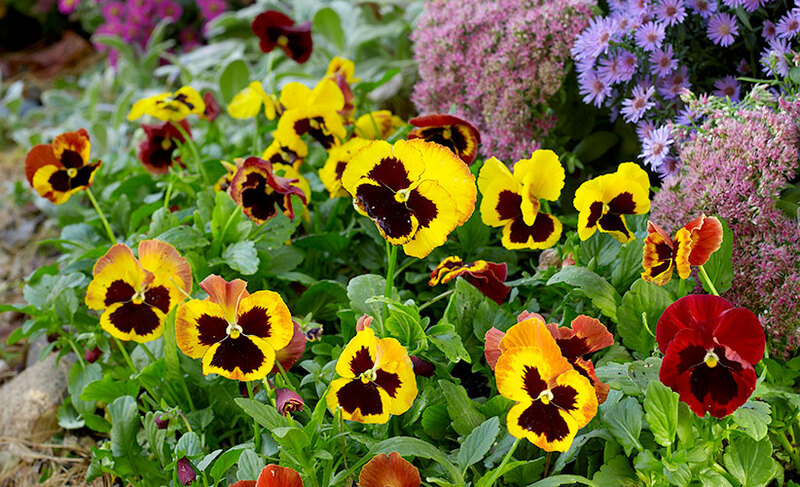 Summer annuals often look great right up until frost, but you may want to plant cold-tolerant annuals and refresh containers — especially those in high visibility spots with autumn plants — for a few extra weeks of frost-proof color. Shop for tree, shrub and perennial bargains and get them in the ground before it freezes. 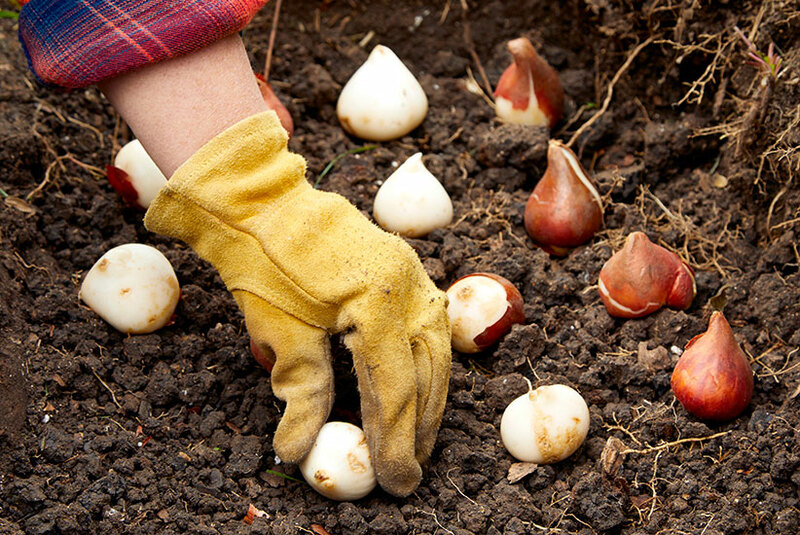 Buy spring-blooming bulbs early for the best selection. Store them in a cool spot until you’re ready to plant. Stop feeding your perennials, trees and shrubs about six weeks before your average first frost (or sometime in September in frost-free areas). Feed your lawn. To keep grass green all winter in the Southeast, consider overseeding now. Divide perennials that bloom in latespring and summer, such as daylilies and daisies. Bring house plants inside before night temperatures dip into the 50s. Watch for insects and treat the problem to cut down on overwintering populations. Rake up and compost leaves. Clean up dried leaves, stems and twigs around the garden. Divide perennials that bloom in spring. Put out the bird feeders and give them an extra snack by making your own suet. Plant trees and shrubs if you haven’t already. Keep them watered until the ground is frozen. Mow the lawn once more and do end-of season maintenance on the mower. Harvest any last produce from the vegetable garden and try to preserve some of the bounty to enjoy in the winter. Spread a layer of compost over the garden so it will be ready to till in spring. Control weeds that have been lurking in the lawn before they set seed. Plant spring-blooming bulbs now. Measure the depth of the bulb, then dig the planting hole three times that measurement. Not sure how many you need? Use our handy bulb calculator! After frost takes annuals down (or if you don’t get frost, whenever you’re ready to clean up), pull the annual plants and put them on the compost pile. If you have some perennials that need to be cleaned up too, follow these instructions. Unless there are disease problems, leave perennials standing until spring. Most will add winter interest, too. Empty, wash and store your containers. Use a dolly to move heavy or large ones. Dump out the potting mix and remove loose dirt and debris with a stiff brush. 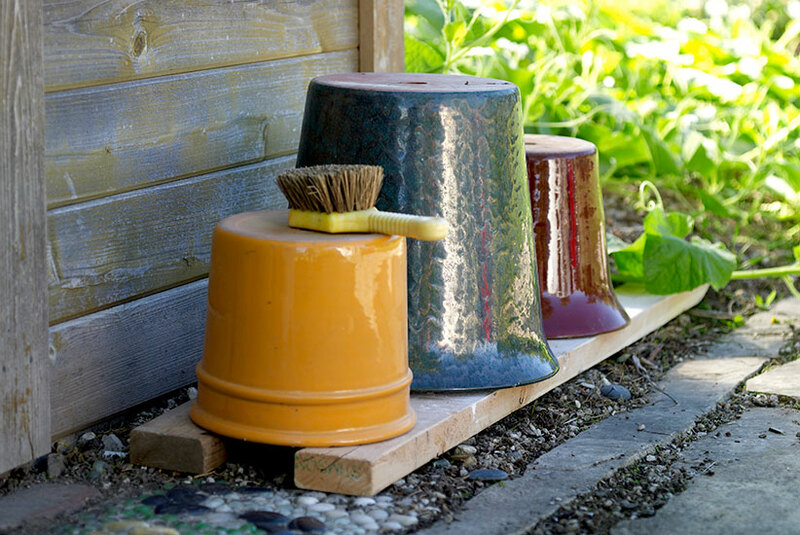 Turn the pots over and store them in a protected spot up off the ground. A couple of 2x4s are enough height to keep moisture from accumulating around the lip of the pot and cracking it. Protect trees and shrubs from winter weather and scavenging animals. Sharpen and put away tools. Cover new perennials, and those that have a tendency to heave, with mulch. Empty the hose and coil it up. Also empty and store the birdbath unless you will be using a heater. Use a garden-friendly deicer, coarse sand or turkey grit instead of salt to melt ice from sidewalks and driveways. Dream about next year’s garden and place orders for new plants early. There are a lot of hostas to choose from. We’ve narrowed it down to 12 of the best hostas for your shade garden! Butterflies love this fall container! Talk about irresistible! That’s what the butterflies think about the gorgeous butterfly bush, asters and other pollinator-friendly plants in this stunning fall container. Have so many tomatoes you don’t know what to do? Here’s an easy way to make paste and juice you can enjoy all winter!